You just had your big beautiful full color poster or point-of-purchase display mounted on heat-activated foamcore board, lamination board or corrugated plastic board on a roll laminating machine – what’s the next step to actually display it? If you have a grommet press, you could punch a couple of holes clean through your artwork to hang it. For those who cringe and think, “No, please don’t destroy my art!” – there is a better, simpler way. Mounting board hangers are great alternatives to grommets that keep all of the art intact and are considerably cheaper than the upfront cost of a grommet press. These cool, little devices are great for hanging your display pieces and are extremely simple and quick to use. Twist-N-Hook hangers are perfect for hanging foam core or GatorBoard up to 24” x 48” – each can support up to 6 pounds. All you do is select your placement of the hook (2 hooks are recommended), then twist the trheaded portion into the board’s core – using a little thumb pressure on the top. Once the hanger is flush, just thread string, wire or fishing line through the opening and you’re ready to hang. 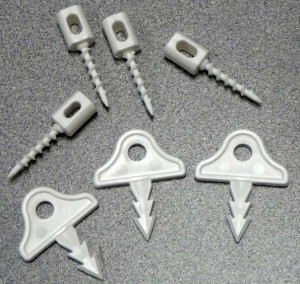 Pic-N-Hook hangers are flat hangers designed just for corrugated plastic boards, with each hook supporting up to 3.5 pounds. Simply locate a preferred spot on the edge of the board and push the sharp babrs in – making sure they punch through the corrugated ridges in the board. Then feed your string or wire through the eyelet and hang away! These little wonders will save you valuable time and money, not to mention your artwork. What are some of the ways you are displaying your mounted artwork?